Kenworth Sales Company President Kyle Treadway was on a tour of Salt Lake Community College’s new Westpointe Workforce Training & Education Center when he decided his company needed to invest in the students who will soon be training within the Westpointe diesel technician program. Treadway said there is a national shortage of diesel technicians, citing U.S. Bureau of Labor Statistics that show 67,000 Baby Boomers retiring from the industry on top of a projected 12 percent growth within the next decade that is creating a need for 75,000 new diesel technicians. “We are in a crisis, and this is an investment to try and solve that,” he added. “I could hire 45 technicians right now, today.” Within three or four years of attaining a one-year diesel technician certificate from SLCC, Treadway noted, the best technicians can be earning an annual salary in excess of $100,000. 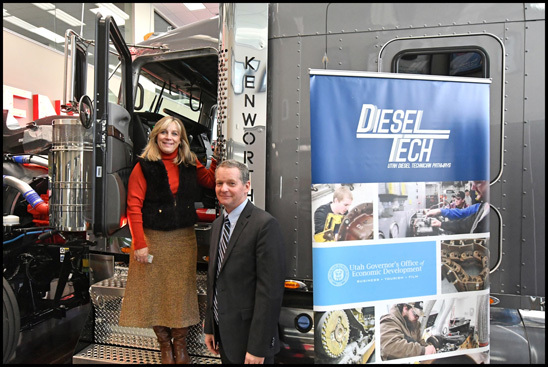 Treadway and Huftalin said the donation is part of a larger statewide effort to address a lack of skilled labor in Utah that includes investing in the Utah Diesel Technician Pathways program, which began in 2016. Today SLCC, several school districts, the State of Utah and industry partners have been educating and training students who are still in high school to prepare for relatively high-paying jobs upon graduation or soon after. Treadway said the donation to Westpointe will not solve Utah’s or Kenworth’s needs in “one full swoop,” and that it marks the continuation of a relationship with SLCC.